Update: I no longer use this roaster, I’ve moved onto a drum roaster. I’m using the Sunpentown SO-2000, a halogen-based oven. 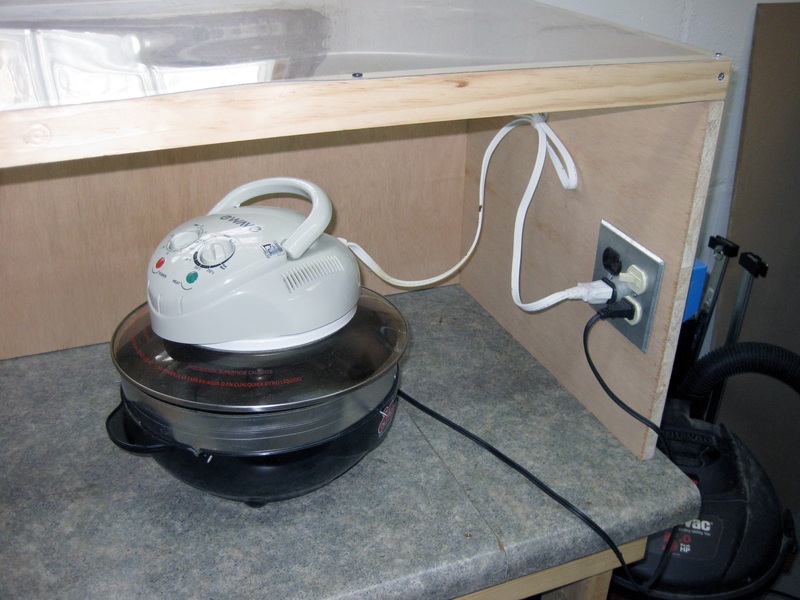 Initially I used cheaper model, an eWave oven but after 10 months its power output took a nose dive and I had to continually lower my charge weight in order to get satisfactory roasts. The Sunpentown model, which I’ve been using since September of 2015 has been working great. I haven’t modified the oven at all so far. I have noticed that the halogen light, being centered in the unit, tends to roast the beans in the middle a touch more than the outer beans. Otherwise the oven works pretty well! It’s powerful enough to roast at least 14oz of greens in about 12 minutes. 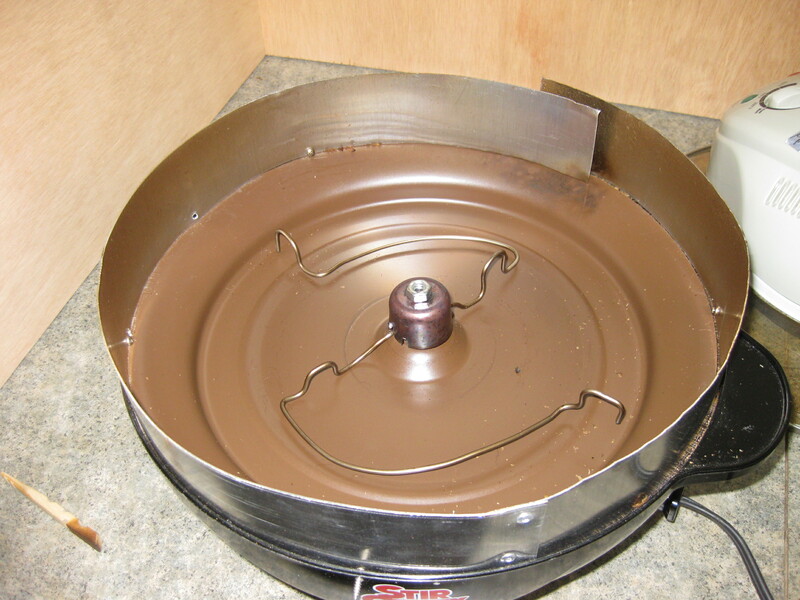 I’m using the standard in coffee roasting, the Stir Crazy. I had initially tried a Presto base but it didn’t pan out. I have the popper’s heater disconnected entirely. The roaster is pre-heated with just the oven. I’m on the “second generation” of the drive shaft. The first was the anchor bolt method but that eventually the plastic shaft melted so badly I was forced to replace it with the classic 7/16″ socket + 1/4″ bolt combination. The three fender washers are the big players in the assembly. The bottom two sandwich a centering bushing while the top one is notched for the stir arm. 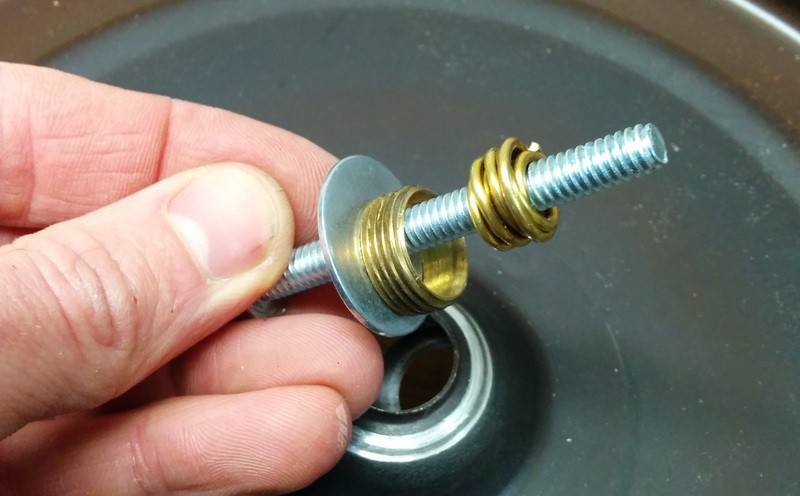 The centering bushing is a the threaded end for a plumbing fitting with some brass wire wrapped inside to center it. This was very seat-of-the-pants. 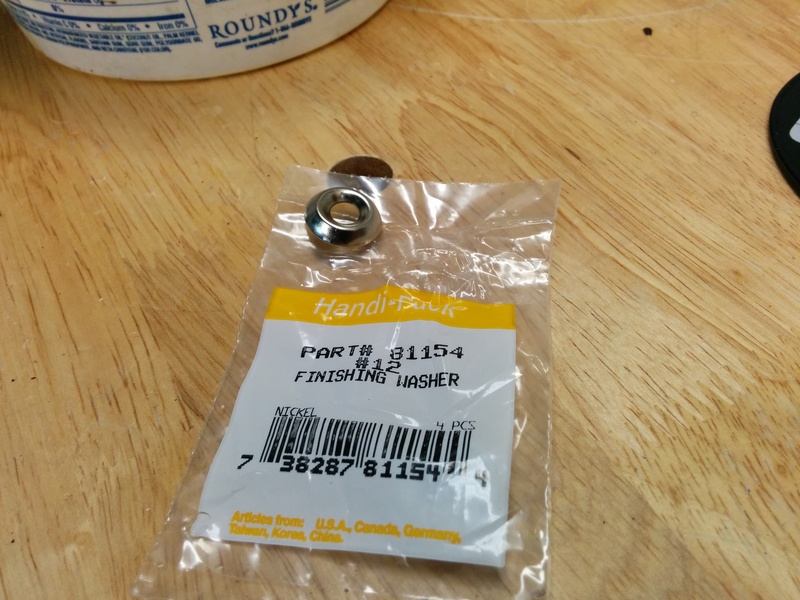 I had purchased #12 finish washers to serve as the centering bushing but they were too narrow for the hole in the popper pan. For the arms I used 3/32″ 304 stainless steel rod from Speedy Metals. This diameter is easy to bend yet is stiff enough for this purpose. I copied Peter’s arm shape, it works very well. 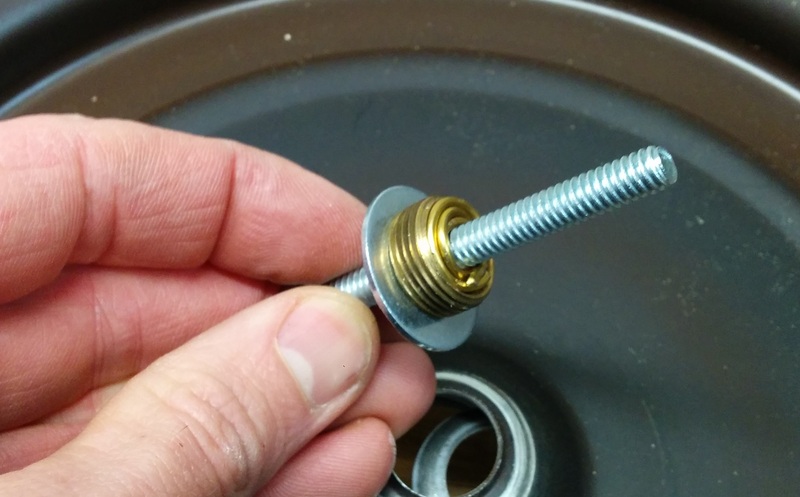 A 1″ copper end cap keeps beans from getting caught in between the arms and drive bolt. My standoff ring is 2″ high and is made from aluminum. I couldn’t find 2″ wide aluminum at the store so I got a rectangular sheet perhaps 20″ x 12″ and cut 2″ strips from it. As you can see i this photo the two ends are riveted together. From the inside-out I screwed the ring to the base using #4 screws. You need to pre-drill these holes in both the base and ring because the popper’s plastic is pretty brittle. Again copying Peter’s design, I left an overlap in back which functions as a chaff ejector / heat modulator. One half of a clothespin keeps it open. Put oven on base, turn on to pre-heat. Go do something else, waiting for the oven to cycle once or twice; this tells me that it’s reach its temperature. Add beans and start a timer. I use 14oz of beans. Stop the roast when I want to. Here’s a video of my process. It was filmed using my old eWave oven but everything except for the temperature setting is the same with the Sunpentown.